Hi everybody! I am VERY sorry for not visiting you so often lately. It has been very hectic here for the last couple of days and I have been very, very busy. Hence, I even barely managed to do any crafting. *sigh* I promise that as soon as I have some more time I'll stop by your blogs and check out your lovely creations! Today is Wednesday and you all know what this mean - it means it's time for another challenge at My mum's craft shop challenges blog. :) We have another great challenge for you this week - we want you to use dies on your project. And we have a fab prize for you again this week. Once again My mum's craft shop is kindly offering a £10 voucher to one lucky winner. How great is that?! They have amazing things in the store, so if you haven't already, check it out! I used Spellbinder's circle and scalloped circle dies. The flowers are a digi stamp from My time made easy's Bold botanical set, the bigger butterfly is a rubber stamp from Rubber stampede and the small butterfly is a clear stamp from Folia. All images were colored with Faber Castell pencils. The yellow papers are from Provo Craft. No info on the dotty paper - this was just a small left-over piece I found in my drawer. In the back I used a doily lace which I decorated with crystals from my stash. Ribbon and lace are from my stash too. Go to My mum's craft shop challenges blog to see the fab cards my teamies made and I hope you will decide to join us at this week's challenge too. 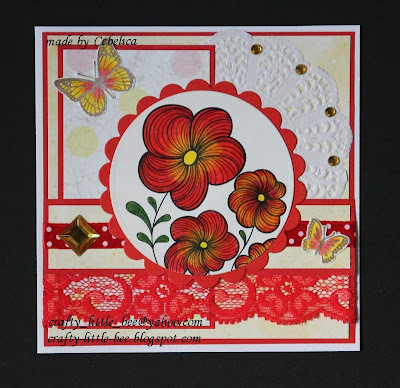 Such a gorgeous card hun!...love the warm colours and super layout too sweetie..
A beautiful card, that red lace is gorgeous, and your colouring on those flowers is fab! Thanks for joining us at The Ribbon Reel this week! Hi Cebelica, love this very cheerful card. Gorgeous image and very pretty details. Hope you manage to get a little crafty time soon hun. So bright and cheerful, thanks for playing along with us this week. Beautiful card, thanks for joining us this week at The Ribbon Reel! Wow, your card is luscious, Cebelica!!! Really fab layout and the colours are HOT!! So pretty, thanks for joining us at The Ribbon Reel! Lovely card and such great colours. Thanks for joining us at The Ribbon Reel this week! Gorgeous - love all the textures and colors! Thanks so much for playin' along with us this week for The Catch The Bug "Anything Goes" Challenge with Bugaboo Stamps!